Autofill for multi drop down? › Forums › Cascading dropdowns › Autofill for multi drop down? This topic contains 5 replies, has 2 voices, and was last updated by Alexander Bautz 1 year ago. I have 2x lookup list fields: 1st field is :Multi, 2nd is :Multi of the ID for the list item. The 2nd field needs to just stamp multiple ID’s when the 1st multi lookup is selected. At the moment, with both fields set as :multi, the user has to click the ID number to add it rather than autofill. Or is there a different configuration I need to use for this? Image attached to see what I mean. This was a bug – can you try replacing the /SPJS/DFFS/plugins/SPJS-casc.js with this file and let me know if it works? Please not that you might need to clear the browser cache – verify that the file version is 3.7.10 when you hover over the “Enhanced with DFFS” link and click the “License and version information”. The first option works but when selecting more options, they don’t get moved across. Also, is it possible to use a Managed Metadata column as the second multi column? I was going to use a Rule to set the metadata field value anyway but thought I would ask if it’s possible? Thanks for your efforts with this. I have made some changes to let the “Autofill subsequent dropdowns when they contain only one valid option” work also when selecting other options where there are only one available option. 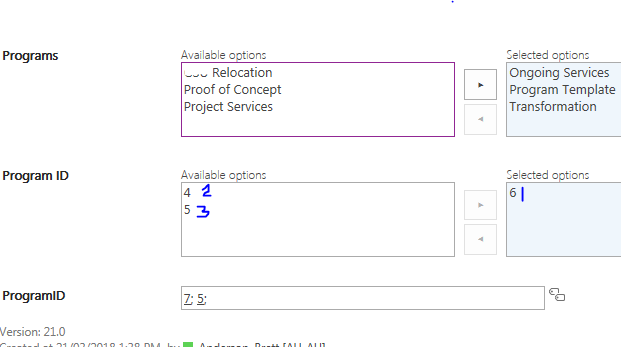 Please note that it will only autofill if the “Available options” select has only one options so if you select first an option that has multiple available options, and then another that has only one, the last selection will not be autofilled because the combined list has more than one option. You find the updated file here. Unfortunately you cannot use anything but single or multiline text fields with this solution. Thank you Alexander, the updated file worked perfectly. Last thing, with Rules Tab, will you be adding Multi-line text fields to run when field changes to a future release?